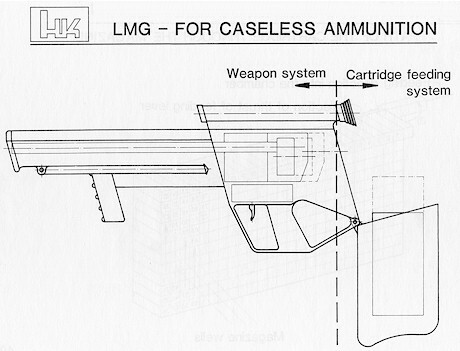 As a natural follow on to the G11 caseless rifle project came the LMG11 or Light Machine Gun. This concept, entirely consistent with the 'weapon system' approach that HK has employed for many years, was conceptualized for greater fire support for troops already fielding the G11 rifle on the battlefield. As with all of the G11 weapons, the rifle, LMG and G11PDW, the project is now dead. Nevertheless, the G11 project remains one of the most ambitious and far reaching attempts by engineers to take small arms design far into the future. I cannot think of any group that would be up to the task more than the engineers at Heckler & Koch. Feeding concept for the G11 LMG. A package of 300 (!) rounds of 4.73 x 33 caseless rounds and their rotation for loading into the firing mechanism is represented here. Firing must be possible in all static and dynamic firing conditions. Effective fire from ranges of 0-600 m.
Overall LMG weight without ammunition must be less than 5 kg. Throw away type magazine desired, capacity 200 rounds. Same caliber as the G11 rifle, 4.73 x 33 caseless. It is not known to what extent this G11 sub-project was developed. The first photograph appears to be an actual weapon, rather than a line drawing, so I am led to believe that at least prototypes were assembled, and the above data appears to indicate firing models existed and were tested. 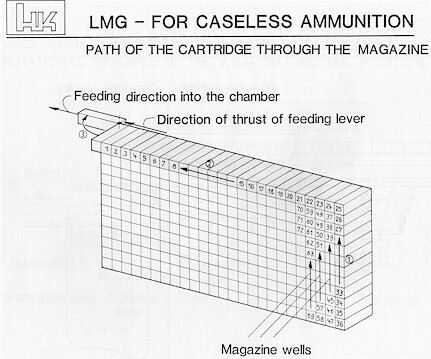 Conceptual drawing demonstrating how the LMG11 would be loaded. 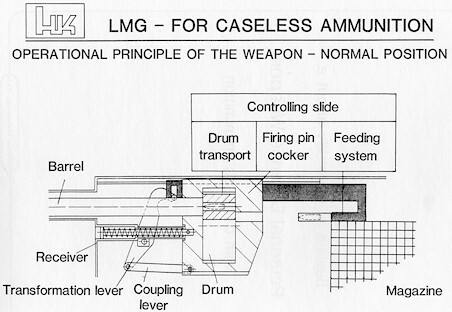 Operating principle for the LMG11. This is not detailed enough to gain a good sense of how the mechanism was to operate, but the complexity and ambition should be obvious. 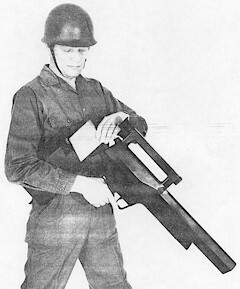 Veteran HK product model and "soldier" Günter Schäfer demonstrates loading the LMG11.